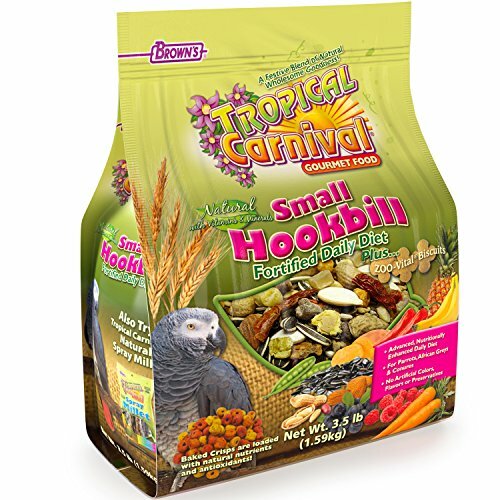 Brown’s Tropical Carnival Natural Small Hookbill Fortified Daily Diet is a vitamin-and-nutrient-fortified food and treat, all-in-one! It’s jam-packed with a medley of delicacies—including chili peppers—to satisfy your pet’s hunger cravings, and it’s specifically formulated for small hookbills’ daily dietary needs. Tropical Carnival Fortified Daily Diet also helps stimulate the natural foraging instinct to help relieve cage boredom. This hearty, great-tasting, healthy food is simply a natural fit! If you have any questions about this product by Tropical Carnival, contact us by completing and submitting the form below. If you are looking for a specif part number, please include it with your message.